Scroll down to read how to use the wheels. For returning game players, the wheels are conveniently on the top so you can quickly come back, spin again and get back to your project. OPTIONAL: Our sample shows 2 rows of white single crochet between each colour. You can opt to do that if you wish before spinning for your next colour. Just use the Single Crochet Instructions for this. Always start the white on the right side (good side) of the blanket and do two rows to ensure the stripe looks consistent all the way through. See below for stitches and more details. Welcome to the interactive game for crocheters where the future of the pattern relies on the spins you make of the wheels below. Choose up to 10 Colours. If you want to use less, you are welcome to do so. Assign each colour a number from 1 -10. For those who use less than 10. You can assign the same colour 2 different numbers or just simply spin the wheel again to hopefully land on a number. We used Caron Simply Soft due to the array of colours that are available. If you need help with colour palettes, we have Diva Dan’s Trendy Colour Combinations to give you colour ideas. Spin the wheels to begin. Each one of the 8 stitches has the starting point from beginning After you have started your project, you will always start the next set of instructions on Row 2. You may just get the same stitch in a row or possibly the same colour… maybe even both. 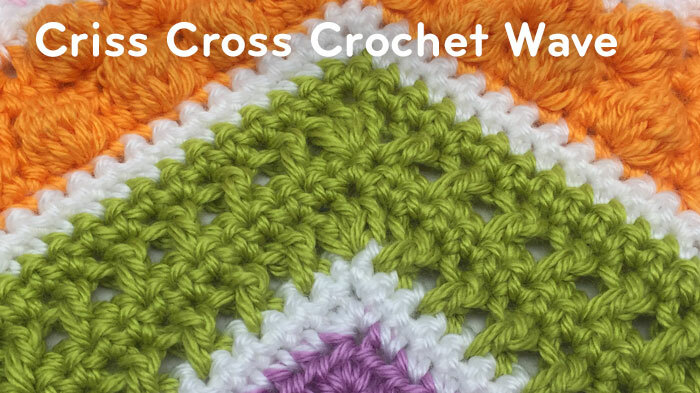 Written instructions, crochet diagram and video tutorials are available for all 8 different stitch choices. We have 8 stitches. We have listed what each stitch is to complete. We have 10 colour options. You assign the colours on your own. For example, Colour 1 is Blue. If you don’t want to use 10 colours and choose you want to use 6 colours. If you land on 7, 8, 9, or 10. Just simply spin again to get a number that you do have. You can use any yarn or colour. It’s up to you. Good Karma – If you land on Good Karma. You must head directly to Facebook and sincerely compliment two crocheter’s projects on The Crochet Crowd. Each wheel has Good Karma and if you land on Good Karma on more than 1 wheel, you need to honour that. So if you land on 2 Good Karmas, you need to compliment 4 crocheter projects. Land on 3, that means you compliment 6 crocheters. Once you have complimented a crocheter, spin the wheel that has Good Karma. Facebook Photo – If you land on Facebook Photo, it means you should try to take a picture of your current WIP and post a picture immediately to The Crochet Crowd Wall. Spin Again – Obviously the wheel didn’t work out for you, spin the wheel that is telling you to spin again. Each one of the instructions has a set repeat pattern. For example, Rows 2 and 3 make up the instruction. The repeat wheel will tell you how many times to do the instruction. We have 8 different stitches. Here is the stitch assignment. Click on the Stitch to get the written instructions, crochet diagram and video tutorial. Modified Front Post Treble Wave Stitch – Spin Again if You Get This One. All instructions and crochet diagrams for each show as if starting from the very beginning. Once you get past the starting of your project, you will start the next set of instructions from Row 2. All tutorials show as if starting from the beginning. For the tutorials, you will just fast forward to the start of the stitch that is required.